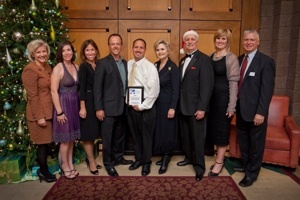 In December 2011, the North Gateway Chamber of Commerce presented Casey Cottrell, owner of Daisy Mountain Painting Services with the Small Business Person of the Year award for 2011. Nominees for the award must demonstrate the following qualities: community involvement, innovation and business accomplishments. Casey proved that Daisy Mountain Painting Services is an excellent example of these qualities. 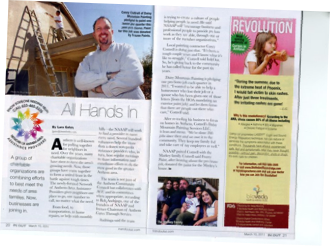 Daisy Mountain Painting provided free exterior paint jobs (one house per quarter) to local families in need with either medical problems of loss of a spouse. This service was offered to homeowners in Anthem that were faced with the undesirable letter from the HOA requiring the painting of their homes in order to avoid costly fines. In October to 2011, Casy Cottrell founded Hands Across Anthem to help a local family coping with a daughter who’d been diagnosed with stage 4 lung and bone cancer. “Hands Across Anthem” started out as a fundraiser that was held at the end of October to help raise money for her fight with cancer. The event served as an inspiration for many, and ultimately led to the creation of the 501(c)(3) non-profit organization that still serves families in need.